Postcard showing what is obviously a bomb-site, but where? 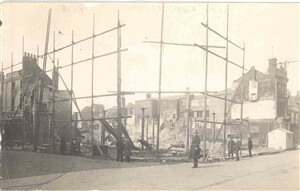 Postcard showing a bomb-site - but where and when? This postcard shows what is obviously a bomb-site, but has anybody any idea where this was, and more particulary, when? Regarding the unknown bomb site. In the 1950's I walked up St Nicholas Road to the market place evey day for years. I reckon that photo is the bomb site which was directly opposite the Silk Mills and directly opposite Belfort Place. Sadly Belfort Place is now gone too, not by Bombers but by supermarkets! Anyway the shape of that bomb site and the white walk look very familiar, but I could be wrong. Not been back home to Great Yarmouth since 1980. Photo of unknown bomb-site. It is on the corner of King Street and Regent Street and is the site of Arnolds Shop fire of 1919-20. The above photo is the site of Arnolds Store on the corner of King Street & Regent Street. This was burnt down in 1919. 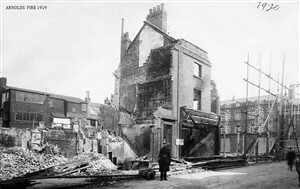 Some of area is bomb damage in King Street and market place ie Palmer Mens Shop--Jarrolds Book Shop etc. Sir the bomb site is on the corner of Alderson road and Palgrave road at the North end. To Bryan Harman, if you take a good look at the photo you will see tram lines in the foreground. There are no tram lines on Alderson Road or Palgrave Road. Re the unknown bomb site. I cannot shed any further light on the photo although it seem familiar It is not the garage on the corner of St. Georges Road, and Nelson Road Central, as this garage (called Serches) was used by the Auxiliary Fire Service during the war, my father was a Fireman and was stationed there also I used to go there as a child to have my hair cut by one of the fireman (Reggie Butler). This garage was not pulled down until after the war.